Generate Project is an on-demand radio, music portal and blog. 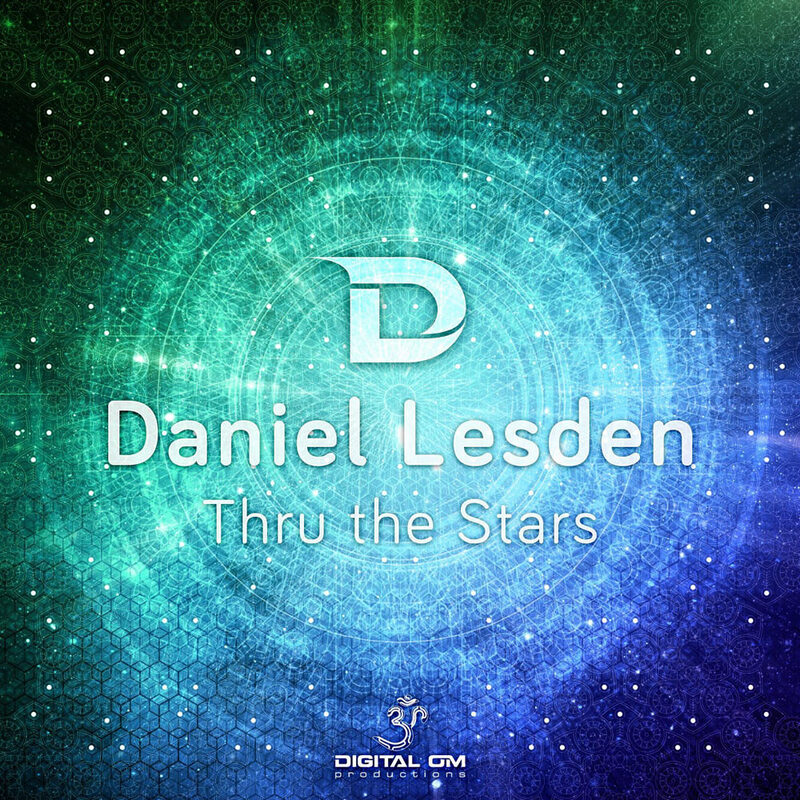 Stuff writer Kostas Voulgaris reviewed Daniel Lesden’s Thru The Stars EP, recently released on Digital Om Productions. If you are one seeking tracks that take you on a mental and musical journey, look no further. Daniel demonstrates his vast interest in our cosmos with this EP which as can be seen is truly out of this world. Mysteries of Time starts off in a somewhat mystical vibe as we find ourselves quickly leaving the known world behind us just by pressing play. There is an evident and unique breath of“space air” within. Daniel introduces us to a trippy atmosphere reminiscent of the golden Goa trance period. He achieves this purpose by borrowing elements from old school trance as well as cleverly using some dubstepy effects to gain even more throttle. This one certainly is the most journey like of the two and will get you to pondering the mysteries of space as well as get your feet moving. This EP is undoubtedly an epic space journey for your mind and feet. Thru The Stars On Autopilot follows the general concept of the previous track with one major difference. This one really goes the extra mile as the track progresses.It certainly hits hard and is loaded with tons of energy preparing to be unleashed. This trip through the stars attains the speed of light as the listener is uplifted both mentally and physically. The genius use of robotic style vocals within enhances the whole space and sci-fi theme brilliantly.It is guaranteed to do major damage on any dance floor whether it is located in our world or another one far far away. Vând Sunete focuses on track recommendations and features everything from new releases to genre classics. This time he reviewed Daniel’s latest EP, Thru The Stars. 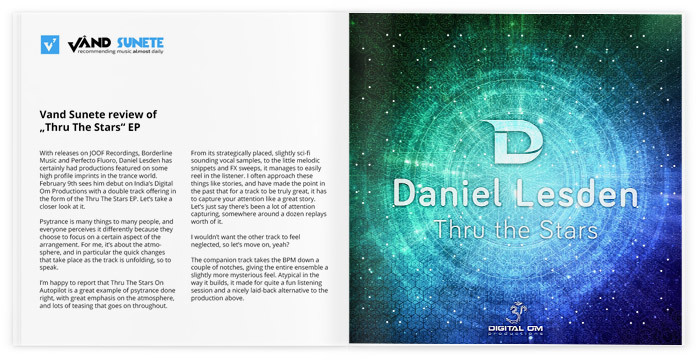 With releases on JOOF Recordings, Borderline Music and Perfecto Fluoro, Daniel Lesden has certainly had productions featured on some high profile imprints in the trance world. February 9th sees him debut on India’s Digital Om Productions with a double track offering in the form of the Thru The Stars EP. Let’s take a closer look at it. Psytrance is many things to many people, and everyone perceives it differently because they choose to focus on a certain aspect of the arrangement. For me, it’s about the atmosphere, and in particular the quick changes that take place as the track is unfolding, so to speak. I’m happy to report that Thru The Stars On Autopilot is a great example of psytrance done right, with great emphasis on the atmosphere, and lots of teasing that goes on throughout. From its strategically placed, slightly sci-fi sounding vocal samples, to the little melodic snippets and FX sweeps, it manages to easily reel in the listener. I often approach these things like stories, and have made the point in the past that for a track to be truly great, it has to capture your attention like a great story. Let’s just say there’s been a lot of attention capturing, somewhere around a dozen replays worth of it. I wouldn’t want the other track to feel neglected, so let’s move on, yeah? The companion track takes the BPM down a couple of notches, giving the entire ensemble a slightly more mysterious feel. Atypical in the way it builds, it made for quite a fun listening session and a nicely laid-back alternative to the production above. There’s a little more emphasis on the progressive side of things, which I did enjoy a lot. It has a rather more pronounced, darker tone, making the choice of the title entirely justified. There’s still time to pick a favourite, as the EP is headed for release on February 9th. Listen to the samples and see which one you like more.